Making a built-in is easy once you understand scribing, fitting strips and French cleats. Here's a solid lesson in all three. Comments or questions? Contact Dim at 513-531-2690 ext. 1407 or [email protected]. Making built-in furniture isn't tough-I've seen lots of f \rst-ttu\e woodworkers build passable bookshelves that fit in the nooks by their fireplace. However, making built-ins that bug the wall, sit level and are anchored firmly to rhe house requires a little more know-how. If you've ever living a cabinet or built in a few shelves, you've probably noticed rhat your rooms aren't square anil your walls aren't plumb. This is usually the result of your house settling. Its also possible your framers or drywallers were, unfortunately, a little sloppy. Either way, don't build your cabinets crooked to fit a catawumpus corner or sloping wall. AI ways build your projects square and add a couple of features to allow diem to fit in an irregular space. There ate two tricks to accommodating out-ot-whack walls: oversized back rabbets and fitting strips. You can easily build the bookcase unit I'm installing. All it takes is one sheet of V' plywood and one-half sheet of Vj" plywood. Best of all, you can build this unit in a weekend. I know, I know - you've heard this story before ("Chippendale Highboy in aWeekend!") but it's true. I built this bookcase in one day and finished it the next. 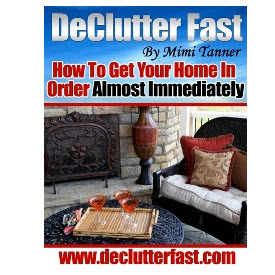 We've included plans and a cut list on page 28 that show you exactly how to do it. All cabinets should have a back that rests in rabbets in the sides of the case. This ensures a tight fit between the back and sides. With freestanding furniture, if your back is '/¿"-thick then the rabbets for that back should he 2" wide. This is not the case with built-ins. You need to cut a rabbet that is significantly wider. 1 make it between 1 '/•»" and 1 '/i", depending on how out of kilter the wall is. This large rabbet creates two long tongues on the back of your cabinet that can be scribed to fit almost any wall. What's scribing? That is when you cut rhe edge of the cabinet so it matches the shape of your wall and fits rightly against it. Scribing isn't difficult, and I'll show you how I go about it later. There are a wide variety of cabinet levelers you can buy, but they all basically work the same way. 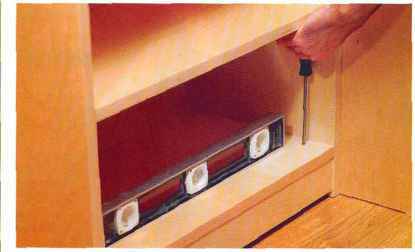 Some are adjustable at both the foot and from above through an access hole you drill in the cabinet's bottom.This feature is a huge convenience when leveling your cabinet on an uneven floor. Once the cabinet is level front-to-back as well as left-to-right, you can plug the holes you drilled to access the leveler hardware. Many brands of levelers come with their own plastic plugs, though a shop-made tapered wooden plug works just as well. These are two other weapons in your arsenal against the crooked wall and odd corner in your house. They are a lot like the large rabbets on the back of your cabinet except they help fit the sides of your cabinet to a wall or an adjacent cabinet. If you're building and installing a face-frame cabinet, your best bet is incorporating a scribe stile into your design. With this technique you make your face-frame stiles (the vertical pieces of rhe frame) wider so they extend over the sides of rhe cabinet by A". Cut a rabbet on rhe backside of the stiles. This makes them easier to scribe to fit. Then you have a seamless way of attaching your cabinets to walls or other cabinets. If you arc building a cabinet without a face frame, you should turn to rhe fitting strip. Fitting strips are attached to the cabinet sides and are cut to fit against a wall. Typically you cut a 45° angle on the backside of the !/4" x I" fitting strip so that when you scribe it there is a lot less material to cut away. There are a variety of different ways to attach a fitting strip to a case. Whatever method you use, avoid using metal fasteners because they could get in the way when you scribe and then trim rhe fitting strip to size. If the case is small, simply glue the fitting strip to rhe side of the case. If the case is large, come up with an alternate plan. It's no tun turning a big case on its side, trimming a little more and then setting it back up over and over again. One solution is to glue a backing board to rhe cabinet behind the fitting strip that is a little narrower. Then you attach the fitting strip to the backing board using several biscuits but no glue. This allows you to set the cabinet against the wall, mark your scribe, cut it and then put the cabinet in place. Then you fine tune the fit by pulling the strip out for more trimming. See the "Complex fitting strip" drawing on page 22. Another issue when installing a built-in is how you actually attach it to the wall. There are a number of ways to do it. Some people simply nin long screws through rhe back and into the studs. 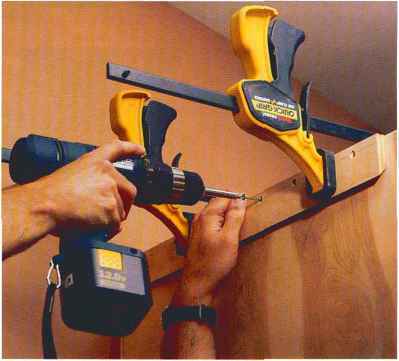 This works, but the screw heads are visible inside the cabinet, and you must use really long screws to reach into the studs across your big back rabbet. French cleat detail Profile view and is nailed or biscuited between the sides - right beneath the top. 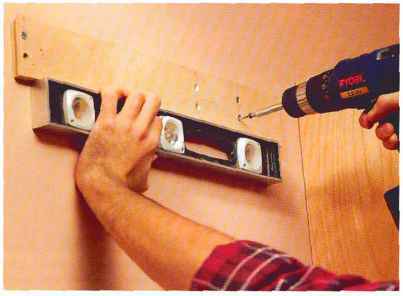 With this system, you attach the cabinet to the wall through the hanging strip using countersunk screws. Then you simply can plug the screws to hide them. 1 prefer using a French cleat. It sounds complicated at first, but once you get it straight in your head you'll see it has some advantages. The French cleat uses two cleats, each with one long edge beveled at 45°. One of the cleats is screwed to the wall and the other is screwed to the back of the cabinet. The two 45° angles nest together, locking the cabinet to the wall. This is a common way to hang kitchen wall cabinets, but I've found it's great for hanging cabinets that go to the floor, too. And I've come up with a method that makes it easy to do. Bur before you can install any cabinet, the first thing you have to do is get ir sitting level on the floor. When building large cabinets, it's best to build a separate base from the cabinet itself that is about 3" to 4" in height. You can then set rhe base in place and level it using wooden shims or leveler feet. Leveler feet are pieces of hardware that attach to the inside corners of your base. The feet screw up and down. You adjust the feet until rhe base is level and then set the cabinet on top ot rhe base and move on to scribing. With smaller cabinets, such as the bookcase shown here, you can skip the separate base and install the leveler feet under rhe bottom shelf or use shims to level the entire cabinet. Either way, get rhe cabinet level letr-to-righi and front-to-back before you begin scribing. Scribing isn't difficult, but it requires practice. The first thing to do is see it your cabinet is going in a corner. If so, you should remove the big back rabbet that goes into the corner entirely - it's only going to get in the way of scribing the other rabbet and the fitting strip (if you have one). Push the cabinet back against the wall or walls until some part of the cabinet meets the wall. Mark a scribe line on your back rabbet. Get a compass that allows you to lock the swinging arm. 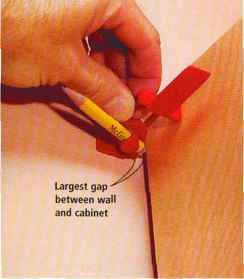 Using a ruler, find rhe biggest gap between your wall and cabinet. Set the distance between the pencil and the compass point to this distance. Now trace the shape of the wall onto rhe back edge of the cabinet. Use the point ot the compass to follow the wall and let the pencil draw that shape onto the cabinet. Keep the compass level. 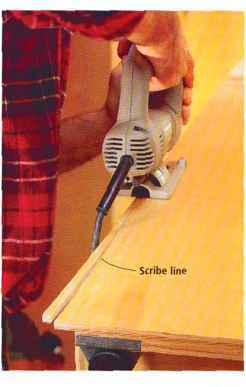 Once you've drawn your scribe line, trim the back rabbet to that line. 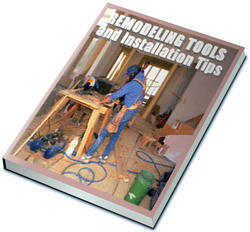 You can use a jigsaw followed by a hand plane, a belt sander or even a hand-held power planer. Test the fir of your scribe line to the wall and make any corrections. Once the back is fit, scribe the fitting strip (if you have one) where the front of the cabinet meets the wall. Once everything fits snugly, attach the case to the wall using your French cleats. 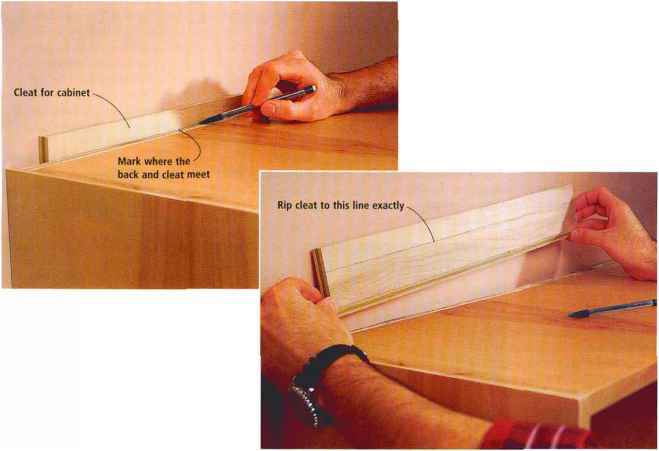 To set your scribing tool, use a ruler to find the biggest gap between the back edge of your cabinet side and the wall. Set your scribe to span this distance exactly. Now run the scribing tool up the back edge of your cabinet - being sure to maintain contact with both the wall and cabinet. The pencil will draw your cut line on the back edge of the cabinet side. Note: The McGrath scribing tool shown here has been discontinued and is no longer available. They hope to make it available again, soon. So for now, use a compass. The concept is exactly the same. Installing French Cleats it's simple toget a perfect fit with these if you follow some simple steps. 1 like to use plywood or any tough hardwood such as maple tor the cleats. First, rip your two cleats to about 3" wide and cut them to length so they're about 1" shorter than the width of the back of your cabinet. If your back piece is 23'/2" wide, then cut the cleats to 22'/j"
Many professionals use a belt sander to remove the material down to the scribe line. Belt sanders are a little too speedy for my tastes. I prefer to use a jigsaw to cut right up to the line (seen here) and then clean up the cut with a block plane. It's still quick, and there's little chance of obliterating your scribe line. Install the first French cleat to your wall using the longest screws available. These screws must anchor the cleat into the stud wall of your house or the cabinet could come toppling down if children ever attempt to climb it. long - this gives you some left-to-right play during installation. First, install a cleat on the wall so it's level and about 2'/V' below where the top of the cabinet will touch the wall. 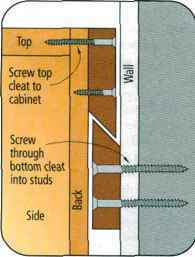 Screw the clear to at least two studs in your wall using ^10 x 3" screws. 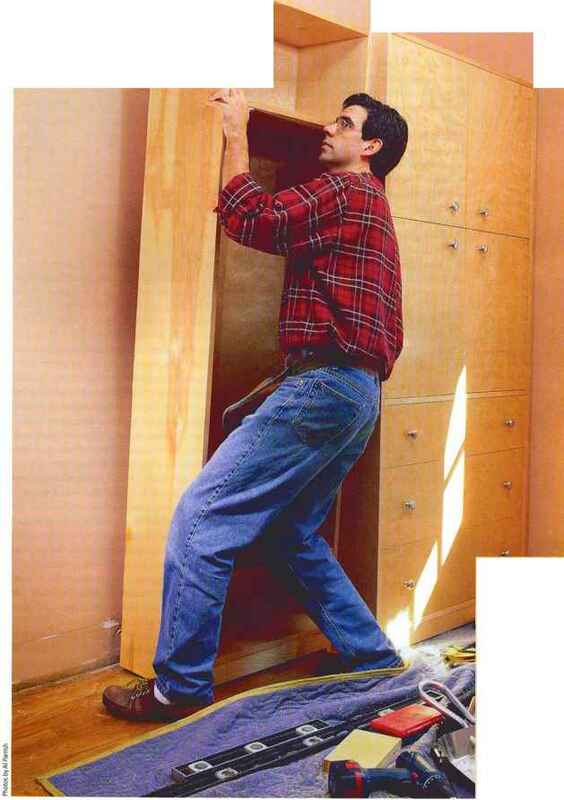 Now push the cabinet in place against the wall and use a stepladder so you can work on the top of the cabinet. Take the other cleat and drop it behind the cabinet with the bevel facing the back of the cabinet. It should drop into place with about h" sticking above the top of the cabinet. Mark a line on the cleat where it intersects with rhe back. Lift the clear out and rip it to width. Be sure to rip it exactly to your line. Pull the cabinet away from rhe wall and screw the cleat to the backside of the cabinet so the top edge of the cleat is flush to the top of the cabinet. With the help of an assistant, lift the cabinet a few inches and place it on the cleat. The cabinet should sir flush against rhe wall, flat on the floor and refuse to rock or move. If rhe cabinet doesn't sit on rhe floor, remove one cleat and shave off a tad from rhe bevel with a hand plane or jointer. Or you can adjust the leveling feet. If the cabinet rocks a bit on the cleat, add a short strip or two of masking tape to the bevel on one cleat and that will tighten things. There are other types of cleats that are useful for hanging cabinets, some shop-made and some store-bought. Try this shop-made cleat: Instead of ripping a 45° bevel on each long edge, cut a rabbet on each. The rabbet should he exactly one-hall the thickness of the cleat so the cleats nest together like a shiplap joint. Install the first cleat against the wall. When you attach the second cleat to the cabinet, nudge ir up /8" and then screw it in place. This will prevent the rabbets from bottoming out when they nest and will give you a litrle play when the cabinet rests on rhe floor. If you don't want a wooden cleat, there are steel and aluminum ones available from woodworking suppliers. 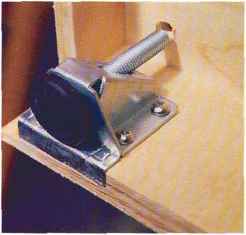 One common steel cleat, available from Rockier (800-279-4441 or rockler.com), has two nesting picces that extend '/ns" off the back of your cabinet. The cleats come in a standard IS" length, but you can hacksaw them to any length you need. At about $5 a set, rhey're a pretty good bargain. With the back rabbet scribed and a cleat screwed to the wall, push youi cabinet in position and drop the second cleat in place behind the cabinet back. Using a sharp pencil (left), mark a line on the cleat where it meets with the cabinet back. Remove the cleat (below) and rip it to width. If you had to scribe near the top of your cabinet, you might have to plane down your cleats a tad, too. There also are aluminum ones available, some of which have bubble levels built-in to make securing the cleat as easy as possible. With the cabinet in place, you might have to screw one of the side pieces to a wall to pull the cabinet tight against it. Sometimes, depending on the weight of the cabinet, you might actually end up pulling the drywall out to the side of the cabinet with your screws. Either way, try to ensure that your case is square after this operation or your drawers and doors might not fit like they did when you built the cabinet in your shop. The cabinet is now complete, except for any trim around the base and crown. To finish rhe run of cabinets shown at the beginning of the article, I Mill need to build and install another large unit with drawers and doors. Then comes the trim moulding. And then a cold beer. Clamp your cleat to the back of the cabinet with the top edges of the cleat and cabinet back perfectly flush. If they're out of kilter you're going to make trouble for yourself, so take care. Screw the cleat to the cabinet using long screws that you countersink into the cleat.